On a sunny April 9th the Campaign for College Opportunity kicked off its first listening tour stop in Los Angeles. Twenty-three leaders from the region representing business, education, labor, philanthropy and civil rights sectors gathered for two hours to talk about the future of higher education in California and in particular, to discuss bold new reforms that are needed in order to address California’s looming workforce shortage. Expand A-G Eligibility. 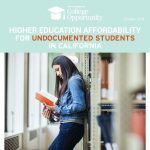 More of California’s students must be eligible to apply to the state’s four-year public universities directly from high school. Common Core Alignment. High Schools and Colleges must be working in an official coordinated way to ensure that the implementation of Common Core at the K-12 level meets the definitions of “college-ready” at the postsecondary level. Otherwise, misalignment will lead to continued issues of underprepared students. Reduce Remediation. Too many California students are deemed in need of remediation when they set foot on a college campus. More must be done to accelerate the remediation process and schools must do a better job of assessing students beyond just using test scores. Expand Capacity. 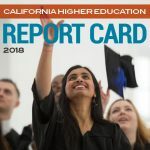 More spots are needed at California’s public four-year universities however, more spots could be available if institutions do a better job of getting more students to graduate, and do so in a timely fashion. Establish a strong coordinating authority. 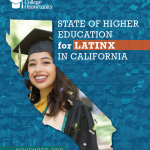 A need for a higher education coordinating authority exists that should collect, analyze and publicize the performance of California’s colleges and universities. Focus on Completion. State funding could be used to support improved student success and completion. A blended formula that funds colleges for the students they serve and for their progress toward completion and ultimate completion would put completion more on par with access. Expand Financial Aid. 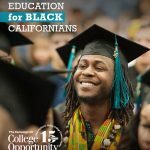 Expand financial aid for community college students so that a total award package not only includes the costs of tuition and fees but costs of living including housing, transportation and books. This would be consistent with the way CSU and UC students are awarded aid. Prioritize Aid. Provide limited financial aid dollars to students who articulate higher education goals and progress toward completion. Moderate, fair, predictable fee increases. Provided financial aid is available for low-income students, a moderate, predictable and fair fee increase at the community colleges would provide much needed revenue to the system. 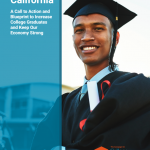 Los Angeles leaders are in agreement that California needs a plan to improve the number of students earning college credentials for the sake of our local and state economies. The key themes that emerged from our conversations give us important insight into the types of bold reforms that can make reaching the goals of a plan possible. The Campaign for College Opportunity was excited to host a room full of leaders ready to bring change to higher education in California. Their enthusiasm gives us the energy to continue these vibrant discussions across the state of California. Next stop, San Diego!